Four years ago, Janet Rafner, the driving force behind the Turbulence game, took a seminar at the University of Virginia entitled “Turbulence in Art and Math” and it changed the way she saw the equations. This course was taught by Prof. Zoran Grujic, who has been instrumental researching the math behind the Turbulence game. The Regions of Intense Vorticity (RIVs) in the game are derived from vortex structures, which are formed from turbulence and are observable at all scales. Various realizations of vortex structures in nature include spiral galaxies, solar wind phenomena, hurricanes and tornadoes, and even tea leaves spiraling in a cup. These vortex structures were so interesting to observe, many famous artists depicted them in their work, such as the painting Starry Night by Vincent van Gogh, Leonardo da Vinci’s drawings of eddy motion, and a woodblock print The Great Wave off Kanagawa by Katsushika Hokusai. Rafner holds dual degrees in physics and art and finds these vortex structures mesmerizing. 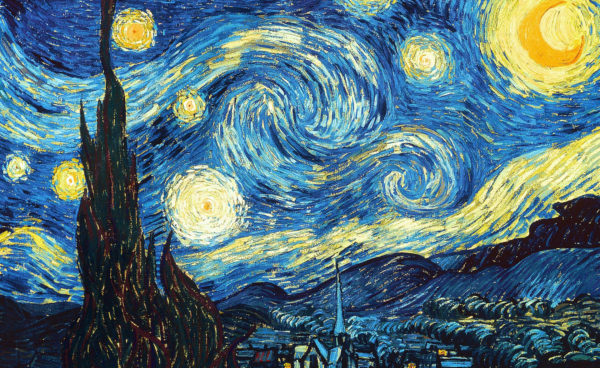 Interested in learning more about turbulence and the math behind Van Gogh’s Starry Night? Check out this TED Video. 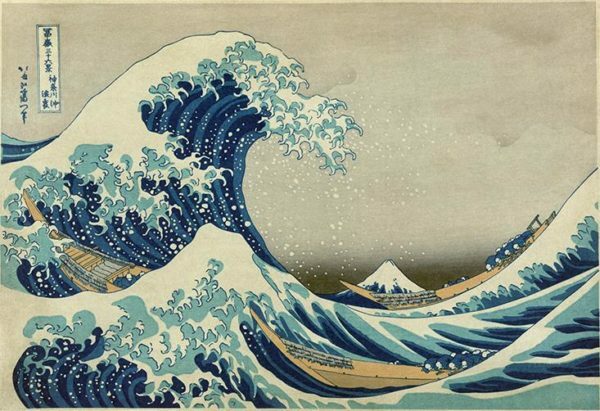 Interested in more about the turbulence in the great wave? Check out this article. 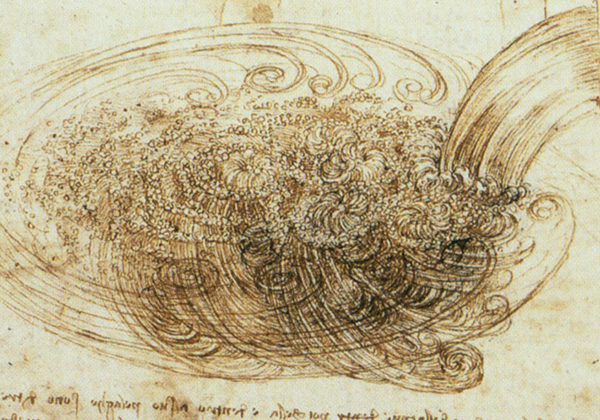 Do you wonder how Da Vinci studied turbulence in this drawings? Check out this blog. Turbulence manifests everywhere in the world and is magnificently and, mysteriously, alluring to many contemporary artists. California-based artist Ned Kahn finds inspiration in “atmospheric physics, geology, astronomy and fluid motion” for his installations. “They incorporate flowing water, fog, sand and light to create complex continually changing systems.” He is quite well known for his installations at the Exploratorium in San Francisco. 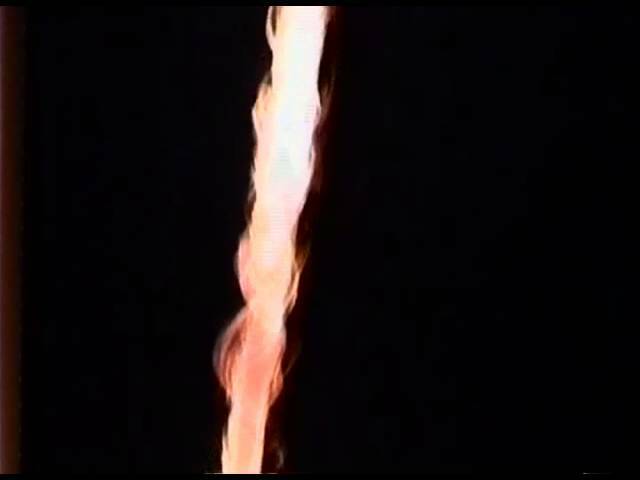 Fire Vortex; Technorama, Winterthur, Switzerland 1997. Rain Oculus; Marina Bay Sands, Singapore 2011. UK artists Ruth Jarman and Joe Gerhardt (also known as Semiconductor) used raw turbulence (solar wind data) to create this art installation, Blackrain. Black Rain is sourced from images collected by the twin satellite, from the solar mission, STEREO. Here we see the HI (Heliospheric Imager) visual data as it tracks interplanetary space for solar wind and CME’s (coronal mass ejections) heading towards Earth. Another research group we love, Physics Reimagined, created a project to show graphical visions of some of the most important physics equations. For example, Navier-Stokes equations, which regulate fluid dynamics and chaos and are at the heart of Turbulence game. Check it out here. But be ready to practice your French!